Some two dozen Egyptian newspapers are suspending publication for a day to protest against a new law they say will prevent them investigating corruption. The papers will not appear on Sunday and journalists plan to stage a demonstration outside parliament. 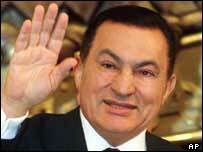 President Hosni Mubarak promised two years ago that he would abolish prison sentences for media offences. But a new draft law makes it a crime punishable by prison to question the financial integrity of individuals. Editors of the newspapers taking part in the protest are hoping that public opinion will pressure the government into changing its position. Mr Mubarak's pledge two years ago was portrayed by the government as a sign that Egypt was moving into a new democratic era. But when last week the government unveiled its planned amendments to the law, journalists were outraged. They were especially shocked at the new offence concerning the financial integrity of individuals. Reporters say it is designed to protect corruption. Parliament has already started debating the bill and there is little hope it will be defeated. The ruling party has a crushing majority in the assembly and many members would prefer it if the press were less free to delve into their affairs. The Egyptian press had become remarkably bold in the past two years, carrying direct criticism of the president and of senior officials. But many now feel that with elections out of the way and the US no longer pressing for reform, the relative freedom of the recent past could be about to end.